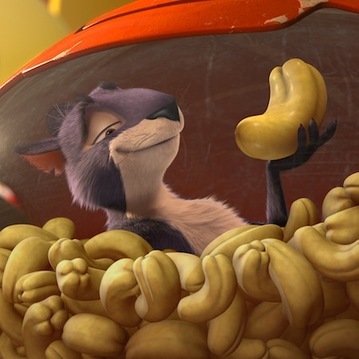 Strictly one for the kids, the animated heist flick The Nut Job zips by thanks to its nonstop barrage of family-friendly mayhem. A cunning, stand-offish squirrel appropriately named Surly plots to break into a nut store and steal away with all the goodies. With winter approaching, and their food supply at an all-time low, the critters that live in a nearby park beg the Will Arnett-voiced Surly to share any spoils with them. Surly’s exiled from the park for conduct unbecoming, so he’s not inclined to help anyone other than Buddy, a rat who serves as Silent Bob to his Jay. That doesn’t stop the park’s four-legged leader, a raccoon voiced by Liam Neeson, from executing his own heist. All that stands between Surly and Raccoon are the mobsters who are using the nut store as part of their plan to rob a bank. Director Peter Lepeniotis’ main goal with The Nut Job is to put in Surly’s way as many hurdles to jump as possible beyond the human threats he faces. The most thrilling setpiece, though, is its first, which involves Surly and a runaway food cart. Everything that comes after seems a little anticlimactic, but Lepeniotis stages Surly’s escapades with the necessary vigor to hold the attention of easily distracted children. It’s open to debate that they will take away The Nut Job’s obvious lessons about embracing community spirit from above all the noise of the chaos Lepeniotis creates around Surly. They certainly won’t notice that The Nut Job is supposed to set in 1959. Nor will their parents. Lepeniotis fails to imbue The Nut Job with a true sense of period—aside from the absent of personal electronic devices, the fictional city in The Nut Job’s looks as contemporary as today’s New York or Chicago. Also, the lead mobster and his moll sound they stepped out of a 1930s Warner Bros. gangster saga. So setting The Nut Job in 1959 seems like a waste of time. As for The Nut Job’s voice cast, it’s obvious that the likes of Arnett, Neeson, Katherine Heigl, and Brenda Fraser realize they’re not lending their talents to an instant classic from Pixar. It’s not that they sound bored—it’s just that they put just enough effort into voicing their characters to almost justify their paychecks. Well, maybe not Neeson. He rushes through his lines as though he’s got somewhere better to be, which makes his Raccoon less of an imposing threat to Surly than he’s supposed to be. Then again, The Nut Job isn’t about Neeson. It’s about the many ways Lepeniotis can cause bodily harm to Surly and his crew and the bodily functions that he thrown in for lazily earned laughs.